According to a recent Microgrid Knowledge study power resiliency is one of the top 3 reasons organizations and communities install a microgrid. Factors such as increasing occurrences of natural disasters, the ongoing threat of cyber attacks and growing awareness of inadequate, outdated or failing grid infrastructure all drive microgrid adoption. Traditional standby generation is no longer adequate. Microgrids provide a platform to keep the power on and operate critical assets over long periods of time while isolated from a damaged or failed grid. Microgrids can generally better manage distributed power generation by providing optimal control, dynamic stability and balancing the demand and generation on a small but critical scale. This white paper provides a survey of current microgrid technology, including its barriers, benefits and application areas. The microgrid feasibility study is considered a recommended means for developing more site-specific requirements and result in a positive return on investment (ROI). The paper also discusses a pre-engineered option for semi-automated, modular control microgrid architecture along with tips for identifying qualified vendors and providers of turnkey solutions. 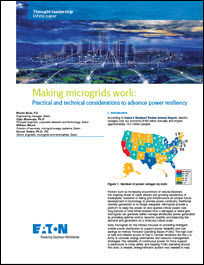 To learn how a microgrid can give your organization improved power resiliency download this white paper.